Anemia or anemia is a decrease in number of red blood cells (RBCs) or less than the normal quantity of hemoglobin in the blood. Hemoglobin is the iron-containing protein molecule in red blood cells that transports oxygen from your lungs to all tissues of the body and, in exchange, collects carbon dioxide from different tissues and transport back to the lungs. A lower level of hemoglobin, would mean low oxygen in all your body's tissues which may result in fatal consequences. First of all you need to make a proper diet containing Iron-Rich Foods. Red meat, organ meat such as kidney and livers, beans, lentils, brown rice, dark green leafy vegetables, such as spinach and kale, dried prunes, dried raisins, dates, pomegranate and egg yolks are excellent sources of Iron. Sometimes your body is getting enough iron but unable to absorb iron. Therefore, Vitamin C is recommended for proper absorption of iron. Along with iron rich foods don't forget to consume Vitamin C rich foods. Natural Important sources of Vitamin C are oranges, tangerines, limes, guava, lemons, papayas, strawberries, grapefruit pomegranate and mangoes. Many vegetables contain Vitamin C including collard greens, brussel sprouts, cabbage, potatoes, kale, spinach(palak), green and red peppers, broccoli, tomatoes and watercress. To preserve more of the Vitamin C content, eat these fruits and vegetables raw or only slightly cooked. Steam and exposure to light break down this vitamin. Deficiency or lack of Vitamin B12 may also cause anemia. 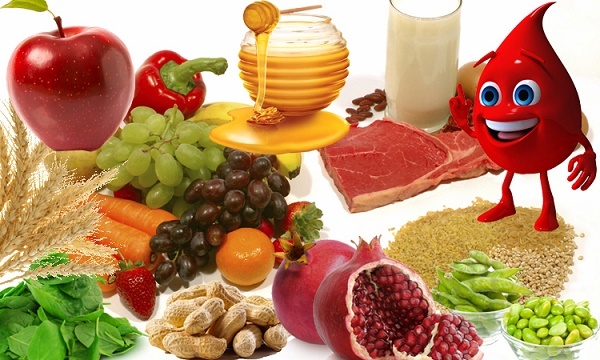 However, eating foods rich in Vitamin B12 is very helpful in treatment of anemia. Liver, kidney, yogurt, cheese, eggs, dairy products, nonfat dry milk, fish, clams, oysters, salmon and sardines are good sources of Vitamin B-12. Folate (Vitamin B-9) Rich foods also considered very effective to treat anemia. Green leafy vegetables such as spinach and asparagus are wonderful sources of Folic Acid(Vitamin B-9). Organ meats including liver and kidney also contain ample amounts of Vitamin B9. Nuts, beans and legumes, shellfish, poultry, whole grains, citrus fruits, fruit juices and yeast are also good sources of Vitamin B-9. Consumption of a ripe banana; mashed and mixed with a tablespoon of honey, helps a lot in treatment of anemia. Consume this on a daily basis to cure anemia. Take 1 teaspoon of honey, 1 teaspoon of lemon juice, and 1 teaspoon of apple cider vinegar. Mix them well and consume on daily basis to treat anemia. Dried Figs works wonderfully to treat anemia. Eat 3-4 figs daily to treat anemia. You can chop dried figs and mix them with 1 tablespoon of honey or alternately you can grind the dried figs to a fine paste and infuse it in a glass of lukewarm milk and have this drink on a daily basis. Consumption of beetroot(chuqandar), as a cooked vegetable or in salad, is one of the best home remedies for anemia. Beetroot juice is also considered very effective to cure anemia. (i)Avoid drinking coffee, tea and all caffeine containing foods because they decrease iron absorption. (ii)Avoid Alcohol it can further drop your hemoglobin level. (iii)Avoid all foods containing high amount of gluten because it creates a hindrance in iron absorption. Avoid white refined flour and also avoid all products containing gluten. (iv)Avoid consuming calcium-rich dairy products with iron-rich foods because the calcium in them reduces the absorption of iron. Maintain a proper eating gap of at least 2-3 hours between dairy products and iron-rich foods. Important Note! Natural home remedies do not substitute for medical advice. In case of severe or acute Anemia you must consult your problem with a Medical Doctor.